Special services are held at various times during the year to mark a special day on the religious calendar or when a unique need arises. Baptisms – People of all ages may request baptism. Please call Pastor Joe Tripp to discuss your wishes. Weddings – Church members have preference when scheduling weddings. Please contact the Church Office for more details and to schedule a meeting with Pastor Joe Tripp. 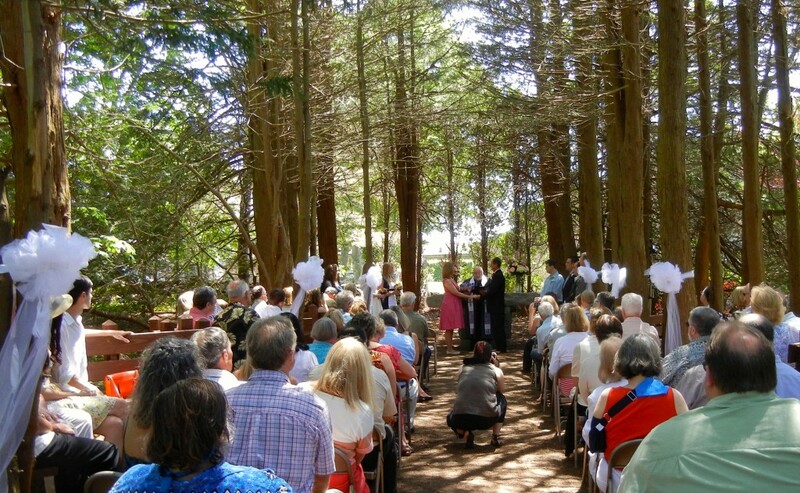 A marriage conducted on our Cedar Chapel during the Summer of 2013. Funerals and Memorial Services – These services are personalized in order to meet the needs of the family. Please contact Pastor Joe Tripp to do advance planning or as soon as the need arises. Internment Options – The Memorial Garden is a burial place on the grounds of the church for the interment of cremated remains. The Memorial Garden is more than a resting place for loved ones. It is a place to meditate, to remember and to give special thanks for lives that have been shared.